Recent research links the U.S. demand for furniture made in China to tree cover loss in Africa’s Congo Basin. Between 2001 and 2015, China became the largest export market for timber from the Congo Basin, and over that same time period, the share of imports of furniture from China to the U.S. grew from 30 percent to 50 percent. The researchers suggest that public awareness campaigns aimed at curbing the demand for such furniture could be a boon for the Congo Basin’s forests. Logging to feed furniture factories in China, spurred by demand from the United States, is thinning the forests of Central Africa, recent research has found. Lead author Trevon Fuller, an ecologist at the University of California, Los Angeles, said he previously learned about research demonstrating that as the demand for ivory in China rose, so did the incidence of elephant poaching in East Africa. That led him to wonder if a similar connection might be instigating the loss of forest in Central Africa’s Congo Basin, home to the world’s second-largest rainforest. Once the research was underway, “The question came up: What’s driving these Chinese companies to extract timber from Central Africa?” Fuller said. The answer? “It’s just an unbelievable amount of demand from [consumers] in the U.S.,” he said. 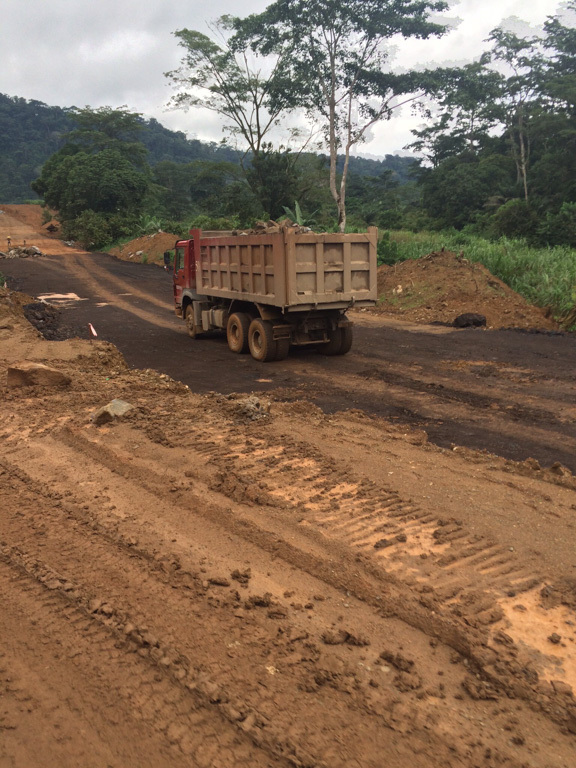 A road in the Southwest region of Cameroon. Image by Trevon Fuller/UCLA. Fuller and his colleagues started by pulling together the statistics on timber exports from five Central African countries to China between 2001 and 2015. During that period, China more than doubled its imports of wood from the Congo Basin and eclipsed the European Union as the region’s biggest export market. The EU Timber Regulation came into effect in 2013, near the end of the study period. It requires “due diligence” from importers to verify that timber they’re bringing into EU markets isn’t illegally harvested, particularly when it comes from “high-risk” countries. Fuller said those restrictions could be a “plausible” factor behind why China had become such a large export market. The researchers published their findings in the journal Area on June 27. To determine the effect that this demand had on forests, the team also looked at satellite data tracking annual rates of tree cover loss in each of the countries. The Democratic Republic of Congo, with the region’s largest bank of forest, didn’t export a lot of wood to China during the study period. Fuller said the DRC’s lack of roads made getting timber out of the forests difficult and expensive, and subsistence farming remains the main cause of deforestation there. 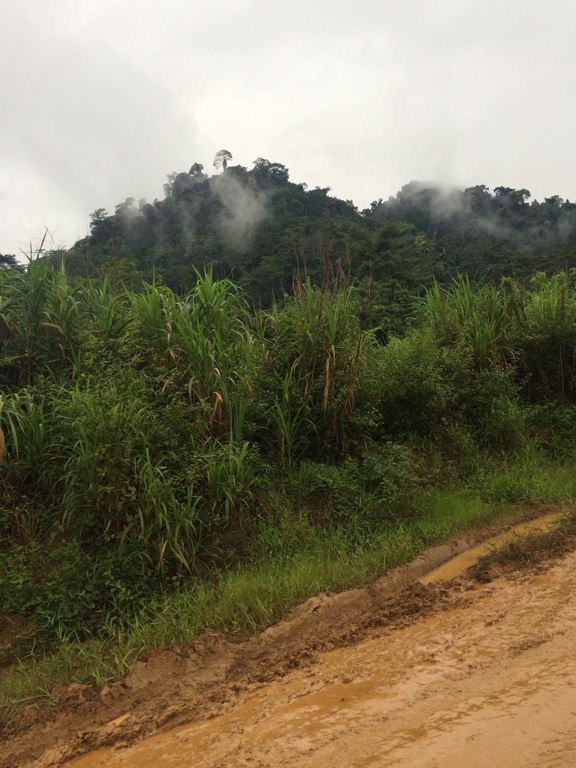 Intact forest seen from a road in Cameroon’s Southwest region. Image by Trevon Fuller/UCLA. But a statistical model revealed a correlation between the levels of timber exports to China and the rate of tree cover loss in the Republic of Congo, Cameroon, Central African Republic and Gabon. What’s more, those export figures did a better job of explaining the countries’ rates of tree cover loss than other factors such as rural population growth, palm oil production, and the existence of logging roads. The analysis also turned up a marked shift in where that wood was coming from. Until 2009, Gabon was China’s major supplier, responsible for 60 percent of the wood exported from the Congo Basin to China. But a 2010 ban on the export of unprocessed logs in Gabon, aimed at building up its own wood processing sector, slashed that figure to 30 percent by 2015. Fuller and his colleagues calculated that the Republic of Congo and Cameroon, where timber regulations aren’t as strict, have made up for the shortfall, and by 2015, together they accounted for half of China’s timber supply from the region. For its part, Gabon’s export ban appears to have benefited the country’s forests. “It reduced deforestation to some extent,” Fuller said. The team also found that tree cover loss in the Republic of Congo and Cameroon was “significantly higher” than it was in Gabon between 2001 and 2015. 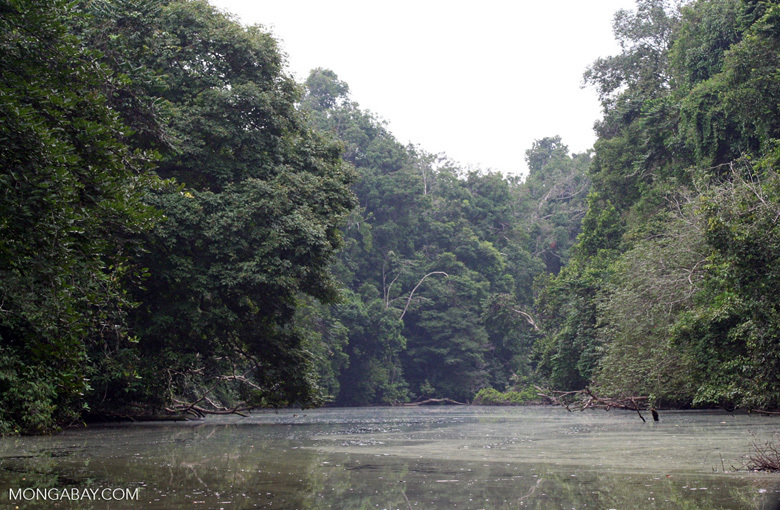 A river cuts through the rainforest in Gabon. Image by Rhett A. Butler/Mongabay. The impact that these restrictions can have should be important consideration for Congo Basin countries, the authors write, especially as Cameroon and Gabon are currently revising their forest codes. Their analysis also revealed that the proportion of furniture arriving in the U.S. from China rose from 30 percent to 50 percent between 2001 and 2015. They suggest curbing some of that demand by encouraging consumers to seek out furniture made from bamboo, recycled wood or plastic. A sustainability certification process for furniture might also provide “a way to combat unsustainable timber extraction,” Fuller said. He also said he would like to investigate the potential for public awareness campaigns, in both China and the U.S.
“Can they change consumers’ buying habits?” he asked. If they are effective in stemming demand, they could hold a key to keeping more of the Congo Basin’s forests, and the vast reserves of carbon and biodiversity they contain, intact. Fuller, T. L., Narins, T. P., Nackoney, J., Bonebrake, T. C., Sesink Clee, P., Morgan, K., … & Anthony, N. M. (2018). Assessing the impact of China’s timber industry on Congo Basin land use change. Area. Wittemyer, G., Daballen, D., & Douglas-Hamilton, I. (2011). Poaching policy: rising ivory prices threaten elephants. Nature, 476(7360), 282.